Remember the cartoon “Super-Friends”? If not, the Saturday Morning staple of the 1970s and 80s saw DC Comics’ heavyweights imposingly handing down life lessons on an episodic basis. While considerably more nuanced, the debut issue of Marvel’s loosely-based all-ladies Avengers squad also succumbs to being a quasi-amorphous mass of capes doling out a public service announcement. 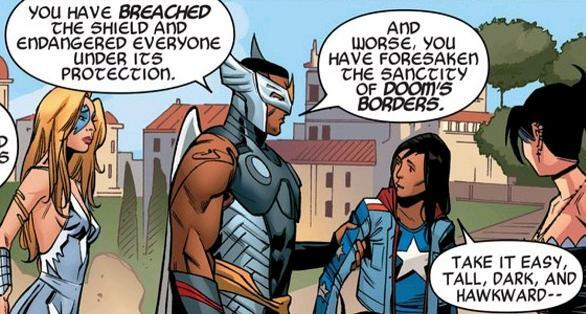 Of course, it is in the name of God Emperor Doctor Doom, so take that for what it’s worth. 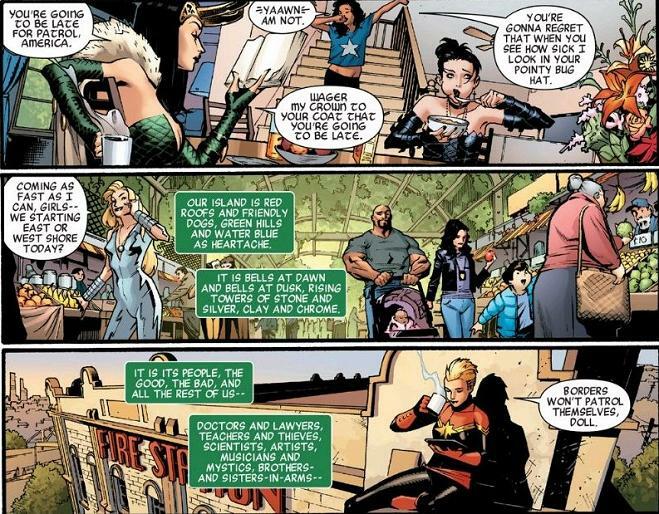 The story is solid enough but much of its detriment owes to paralleling many beats from last week’s Secret Wars #2. For anyone familiar with the core series, it is evident that if one breaks any of Doom’s laws, one goes to the Wall-like Shield to defend Battleworld from the zombies, killer robots and giant space bugs beyond. This cautionary tale is expertly re-explained (different crime) but eats up a bulk of pages all the same. Granted, there is far more pathos than career crazy Jamie Braddock could ever muster but the mechanics are transparently similar. So, keeping score: Conspiracy and treason gets you The Shield. Accidental property damage and littering in a forbidden domain gets you The Shield. Man, it’s like that town from the first Shrek movie! Arcadia makes for nice postcards! Furthering comparisons, there’s also many instances of one-upping the Hickman/Ribic centerpiece. Running with the “already in progress” backdrop, writers G. Willow Wilson and Marguerite Bennett take the cold, cursory status quo addressing of Secret Wars and flip the frown upside down, introducing a super-immersive idyllic paradise. The opening three-page framing sequence sets the mood like a symphonic overture, warmly capturing attention if not imagination. 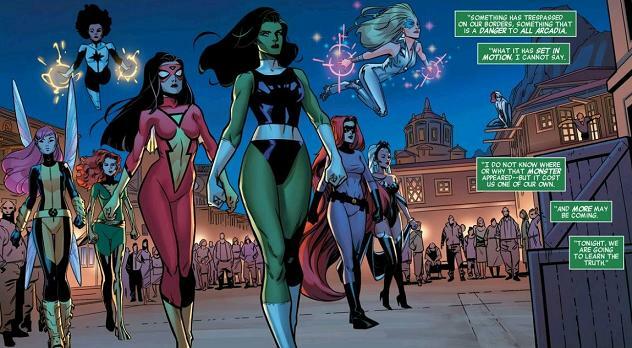 Casting She-Hulk as the leader/ “hub” character is in an interesting choice. A stalwart of the Avengers and Fantastic Four since the early 1980s, She-Hulk is as iconic as she is a renowned team player. However, her career is not exactly screaming the stuff of Captain America. More than anything, her tenures with Earth’s Mightiest are earmarked by her being continually mind-controlled into an “enemy within” rage weapon and quitting out of guilt and embarrassment (a la cousin Bruce). This and her proven record of enforcing unpopular legislature (Civil War) may be the reasons why Doom hands her the keys to the island of Arcadia. Still going with that, huh? Many old school fans complain about the lack of pageantry in the Avengers for the last decade. Not only is there the implied nod to Roy Thomas’s 1970 “Lady Liberators” story (Avengers #83) but an equally-subtle callback to Kurt Busiek’s Morgana LeFay re-imagining. 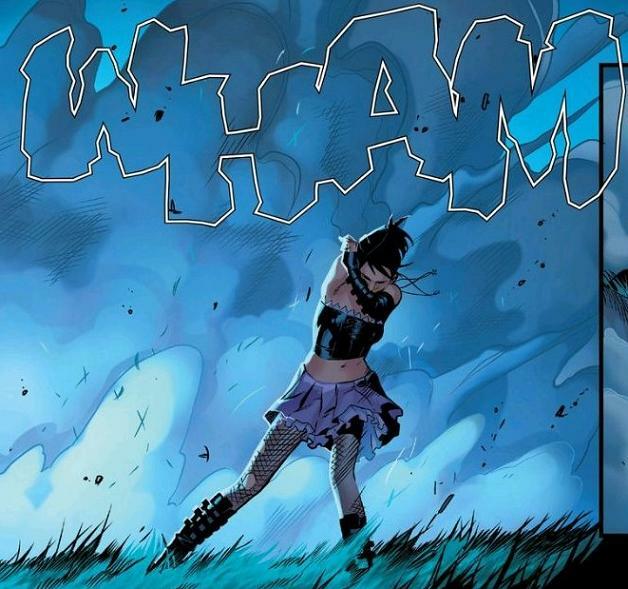 The visual team of penciler/co-inker Jorge Molina, inker Craig Yeung, color artists Laura Martin and Matt Milla and letterer Cory Pettit possess credits of varying repute but have never before functioned as an ensemble. To their collective ability, there is much promise for future issues. One of many “Official Handbook” parades! However, cramming a whole lotta cast in Pacheco/Perez-style sometimes cuts two ways. Some characters just stand around as retro-dressed easter eggs, saying nothing yet contributing to the looming homogenous “hero-blob” overmind by virtue of presence. This “Every Marvel Lady Ever is now an Avenger” produces some surprise left-field friendships and an astonishingly nurturing Loki but where things really excel is in the quieter solo outro of Nico Minoru. Sadly, just as it starts getting good- it ends, more in abrupt anticlimax than cliffhanger. Overall, the issue would benefit from additional pages, different pacing and/or less teaching lessons. Although Wilson and Bennett paint fantastic broad strokes but linger overlong on the wrong details, it’s an impressive debut effort with loads of potential. Developments will be interesting but think of this as the “Zero Volume” demo- the real deal will be making these Avengers a force post-Secret Wars. Although Wilson and Bennett paint fantastic broad strokes but linger overlong on the wrong details, it’s an impressive debut effort with loads of potential. Well, I think anything’s better than that. But my favorite teams are ones where the female/male ratio is equal, or very close to it. Peter David’s second X-Factor run is a good example of what I want to see more of. Isolationism? I don’t see it. 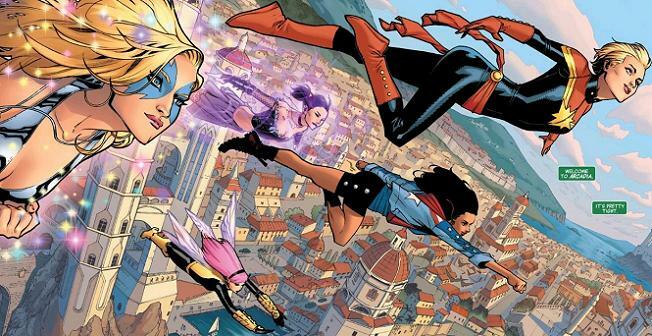 I’ve actually read A-Force #1 and I thought it was okay, but as a man, I have NO problems with an all-female superhero group. Better that than a “mixed” group with a token woman who isn’t very effective. She-Hulk’s leadership being tested is interesting. Dazzler in her original outfit is a head-scratcher. 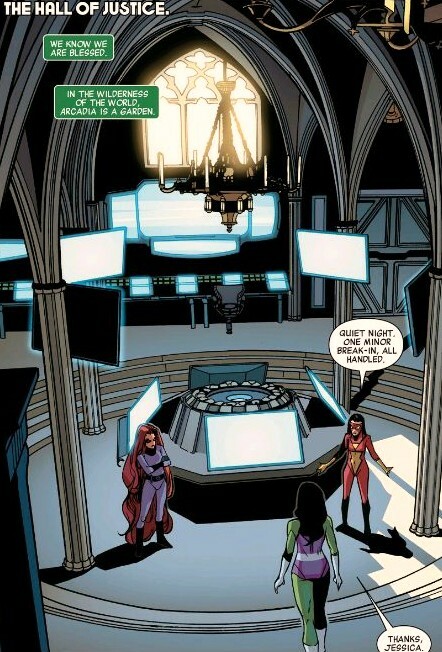 I wanted to see more of a certain heroine interacting with the A-Force. This issue didn’t wow me, but it has potential for some good pathos-building. I have no interest in A-Force, because I don’t like teams that are all one gender, be it female or male. This kind of homogenization and thinly coded isolationism is exactly what the modern comics industry should be working against, in my opinion. There are more “out & proud” fangirls than ever, true, but this is exactly the opposite of what a lot of us are looking for. Bennett and Wilson are talented writers, and I’m sure the product is well crafted, but I cannot in good conscience support it, as I feel it would hold back genuine progress in the world of superhero comic books. I agree. Total isolationism. Marvel trying to “shake things up” and become more modern seems too forced. A-forced, that is.